You have to knead all the ingredients. First start with the flour and butter, add the eggs, sugar, salt and the lemon peel. Finally, add the yeast. If you don`t know how to work with yeast check out this post. For this recipe, just put the yeast in 150ml milk and add 1 spoon sugar. When you`re done the kneading, leave the dough to rise for about 30 minutes. The filling is very easy to prepare. First, mix the nuts with the sugar, and then add the milk (the milk has to be hot). Just do the same thing you did with the nut filling. Mix the sugar with the poppy seeds and then add the hot milk. Tip: If the filling becomes hard to work with, just add some a little bit of warm milk to it. The filling should be easy to work with. And now that everything is prepared to let`s start baking baigli! Split the dough into 4 equal parts. Put one part on a wooden board or kitchen counter (first, pour some flour so the dough won`t be sticky). And use a rolling pin to stretch out the dough, try to make it rectangle shaped. Put half of the nuts filling over the dough, using a knife can be easier. Try and put the filling all over the dough. Then, just roll up the dough. Do the same thing with the poppy seed baigli. And put them on a tray. Beat an egg, and using a rubber brush, grease the top of the baiglies. And stick a fork a few times into them. Put them in the oven, and let it take for about 45minutes, at medium heat. You can make the toothpick test to make sure they`re done. Linking up with these amazing parties! Come and join us! Thanks for the recype and for a great photo tutorial! well this looks delicious! thanks for sharing. and thanks so much for stopping by and commenting on my paris trip, i truly appreciate it! This is a great recipe. I used to eat something similar in my childhood and I loved it! I'll take mine with a cup of green tea please. I have never heard of Baigli before but it looks great! These look fantastic! I'd need to get over my fear of yeast to make them! 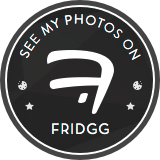 I like all the photos - makes me feel like I was there with you in the kitchen. 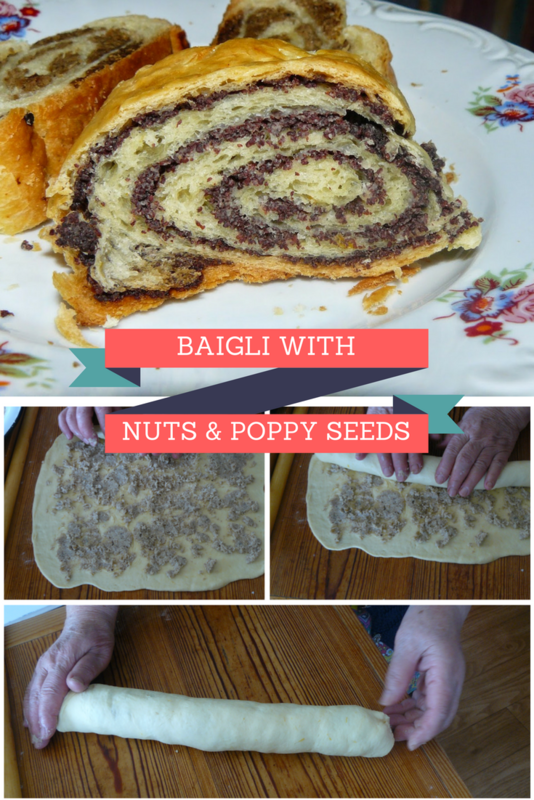 I've never heard of Baigli, but if it has a bread and nuts, I know I would love it! Thanks for sharing your family recipe. Blessings! Looks absolutely yummy. Wait! I am off to get the ingredients. I have to try this. I love tried and true family recipes! This looks amazing…and yummy! I love poppy seeds; especially lemon poppy seed muffins. Yes, life is more beautiful with such delicious food ! 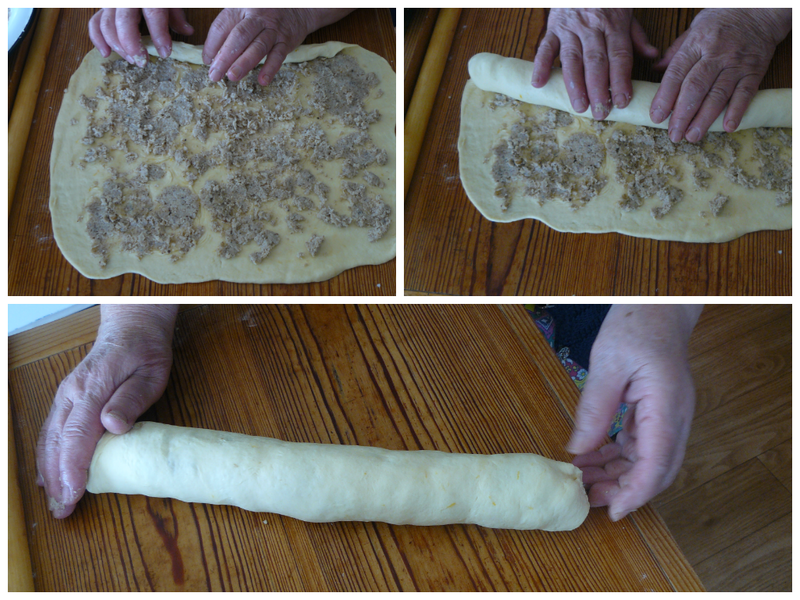 This looks very similar to a roll my mom always made called roolyet (Russian). Yummy! Yes, life is more beautiful with these cakes , delicious photos ! 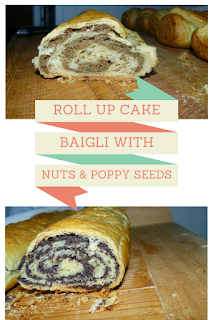 I have never heard of Baigli but I love the idea of a family recipe being handed down from generation to generation. Your post is beautifully presented. My Grandmother had a recipe very similar to that but she called it potica. I love the nut version! I'd like a beautiful slice of that right now! With a strong cup of a coffee! Thanks for a delicious and bountiful link for the letter "B". Hi my friend! I want to say that this post is awesome, nice written and come with almost all vital infos. This looks very similar to a pastry a co-worker once shared with me. I can't wait to try this recipe! These look simply delicious! Thank you for sharing on Family Joy Blog Link-Up Party! It looks so tasty! Your family is very lucky to have you as the mom. Thank you for your nice thoughts Carol. These are sooo yummy. We always made these in my dad's bakery growing up. Your recipe is very similar. You have inspired me, so now I have to go try your recipe out! Thank you. I`m sure you will not regret it! This looks delicious! Thank you for sharing at Link It Up Wednesday. This looks superb! Thanks for sharing. These look delicious, but the poppy seed variety must be beyond delicious. I love poppy seed roll and needed a really authentic home made recipe. Pinning and thank you very much for sharing. I love family recipes, Cris, and your Baigli look delicious! It's so nice to learn about family holiday traditions like this! Shared on our Hearth and Soul Facebook page. What a pretty loaf! I had never heard of Baigli before and I love learning about international recipes. :) I am going to see if I can find a way to make this without the nuts (allergies) and just use a poppyseed filling. Thank you for sharing your family recipe! I've never made anything like this, but I do love poppy seeds in cakes, so I'll be sure to give it a try. Thank you for sharing at The Really Crafty Link Party. Pinned! That looks so delicious........... I will surely suggest my mom to make this for me. This looks TOO GOOD not to try! Thanks! Oh yum, this would be the perfect dessert! I'll be making this soon! The cake is really delicious. With your detailed instructions, I have made this successfully and my brother likes it very much. Looks super yummy! A great super easy to follow recipe as well, if my step daughter wasn't allergic to seeds I would probably try it out. Oooh these are making so hungry! they look amazing! i haven't baked in ages so it would be great to start again with this! Sounds like a great recipe. Love anything with poppy seeds. Will try this sometime. Yes, please! I'm loving the looks of this! It's something I've never had before and it's definitely interesting for me. I'd love to give this recipe a try! I'm sure the kids will like it as well. I love that this recipe has been in your family for so many years. It looks really good and very easy to make.